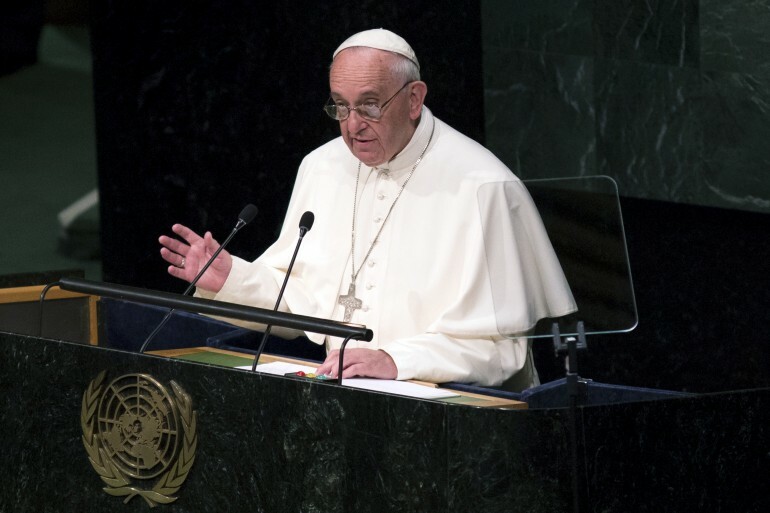 Pope Francis criticized the global War on Drugs in his address to the United Nations on Friday. While the Catholic Church’s Vicar of Christ did not prescribe specific solutions, he spoke plainly the shortcomings of efforts to combat drug trafficking and the effects on everyday citizens. While he didn’t name the country, his remarks could have perfectly described Mexico, where efforts to destroy narco leadership has not made the country more secure. The Vatican leader compared the ongoing violence between narcotics gangs and government anti-narcotics agents to the armed conflicts in the Middle East and North Africa. After describing his concerns over “systemic violence” in countries like Syria and Ukraine, Pope Francis transitioned to speaking about violence related to the worlds various drug wars. “Along the same lines I would mention another kind of conflict which is not always so open, yet is silently killing millions of people. Another kind of war experienced by many of our societies as a result of the narcotics trade,” Pope Francis said. The Pope’s address distills the festering frustrations of many of his faithful across Latin America who have to deal with the daily problems that accompany the War on Drugs, from Mexico, to Colombia, to Brazil. Francis argues that the negative result is not just the availability of drugs, but a surplus of criminal activity and violence. Without naming individual countries, the Pope told the U.N. General Assembly that the Drug War was failing. Pope Francis, who is from Argentina, is no doubt aware of the effects of drug trafficking in the Americas as well as the the recent efforts by leaders in Uruguay, Brazil, Colombia and other countries to rethink their anti-drug strategies. In Colombia, an emerging peace deal between FARC rebels could change the direction of the counter-narcotics efforts in that country, which has been fueled for decades by political and ideological conflicts. President Juan Manuel Santos has signaled openness to a new approach, including decriminalization and legalization of drugs. The Pope did not support such proposals, but he did not condemn them, either. In heavily Catholic countries like Colombia, the Pope’s comments could help Santos build political will for making hard choices about drug enforcement. The status quo, Pope Francis argues, is leading to the collapse of well-meaning public institutions. Is The Pope Talking About Enrique Peña Nieto? Nowhere is that threat to civil society seen more plainly than in Mexico, where Sinaloa Cartel leader Joaquín ‘El Chapo’ Guzmán is still on the run after escaping from Mexico’s most secure prison months ago. Mexican officials say that Guzmán's entrenched power enabled him to bribed prison officials, and many suspect that he decided to escape after illicitly learning of an extradition request against him. Mexico in particular has suffered following attempts by the government to directly confront narcotics cartels. Over 164,000 Mexicans have died between 2007 and 2014 in the militarized escalation that begain under former President Felipe Calderón. That’s more deaths than occurred Afghanistan in the same period, according to PBS. The day before the Pope’s remarks, Mexican families of Ayotzinapa victims marked the one-year anniversary of the disappearance and suspected deaths of 43 protesting students, reportedly a consequence of collusion between government officials and local drug cartels. Representitives of the family say that Enrique Peña Nieto has not met any of their demands for transparency, and some hve even lobbied cartel leaders to solve the case.